Gov. Ron DeSantis, appearing in areas hit hard by outbreaks of toxic algae and red tide, signed an executive order Thursday expanding state efforts to improve Florida’s troubled waters. “I pledged I would take action, and today I’m taking action,” DeSantis said while at Florida Gulf Coast University’s Vester Marine and Environmental Science Research Field Station in Bonita Springs. The order drew praise and concerns from environmentalists and Democrats. Manley Fuller, the longtime Florida Wildlife Federation executive director who announced Tuesday he is leaving at the end of the month for a new job with the North Carolina Wildlife Federation, called DeSantis’ order a “very good start” and said he was glad to see the enforcement of environmental laws is a priority for the new governor. Still, details on spending and protections are needed on issues such as the reservoir and the state’s natural springs, he said. The reservoir is a key part of a plan to curb algae problems that have been linked to polluted discharges from Lake Okeechobee going into waterways in Southeast and Southwest Florida. “He has clearly heard the cries of Floridians who have had enough of perennial algae outbreaks, and to scientists and engineers who confirm that construction of the reservoir will reduce algae-causing Lake Okeechobee discharges by more than half,” Eikenberg said. DeSantis’ order calls for $2.5 billion over the next four years for Everglades restoration and water resource protection --- a $1 billion increase over what was spent the prior four years --- as well as creation of the Office of Environmental Accountability and Transparency and the Office of Resilience and Coastal Protection, both within the Department of Environmental Protection. The governor also instructed the South Florida Water Management District to “immediately” start the next phase of the reservoir project south of Lake Okeechobee and to work with the U.S. Army Corps of Engineers to keep the project on schedule. But on Wednesday, Florida Atlantic University researcher Brian Lapointe, called the Everglades reservoir “a distraction” as he told the Senate Agriculture, Environment and General Government Appropriations Subcommittee that the Department of Environmental Protection needs to concentrate on septic systems that release nutrients into area waterways. Senate Minority Leader Audrey Gibson, D-Jacksonville, said in a news release Thursday she was “encouraged” by DeSantis’ “first steps” to address the state’s water problems. But while describing the order as having “lofty goals” and “admirable pursuits,” she said more details are needed, particularly on the $2.5 billion request. The environmental funding, expected to rely on voter-approved conservation money set aside in the state’s Land Acquisition Trust Fund, will depend on annual legislative approvals. Among a number of directives in the order, the Department of Environmental Protection would establish a matching grant program for septic tank conversion. Local governments would have to put up matching money for the program, which could lead to property owners hooking up to sewer systems instead of using septic tanks. Gibson questioned the septic-tank conversion plan for not stating how much of it would require payments from homeowners. 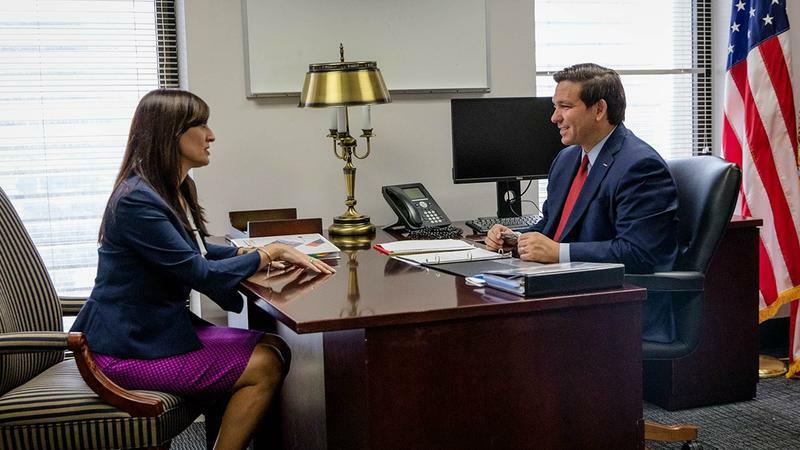 DeSantis also directed the Department of Environmental Protection to partner with the tourism-marketing agency Visit Florida and the Department of Economic Opportunity on issues that include investments in green infrastructure. DeSantis’ order also establishes a Blue-Green Algae Task Force, which would work with a task force that Scott asked the Florida Fish and Wildlife Conservation Commission to reactivate last year. DeSantis, who campaigned as a critic of the Big Sugar farmers, said he is working with the White House and U.S. Army Corps to end the massive water releases from Lake Okeechobee. Residents living along the St. Lucie and Caloosahatchee estuaries have blamed the discharges of polluted water from the lake for toxic algae outbreaks. And, DeSantis, without mentioning climate change, said the state needs to be “ahead of the curve” on increased flooding and rising waters, which will be a job of the Office of Resilience and Coastal Protection. “We want to make sure that Florida is doing what it needs to do to protect its communities,” he said. Incoming Gov. Ron DeSantis bemoaned Medicaid costs while in Congress and while on the campaign trail, but he is being asked by some members of his health-care advisory committee to consider expanding Medicaid eligibility to people with substance-use disorders. Jacksonville resident Kent Stermon is leading Florida Governor-Elect Ron DeSantis’ advisory committee on public safety. Supporters of Gov.-elect Ron DeSantis want Florida to take a more active role in finding innovative ways to overhaul how health care is delivered in the state. The chair of Gov.-elect Ron DeSantis’ Transition Advisory Committee on the Environment, Natural Resources and Agriculture says the environment will be a priority under the DeSantis administration. 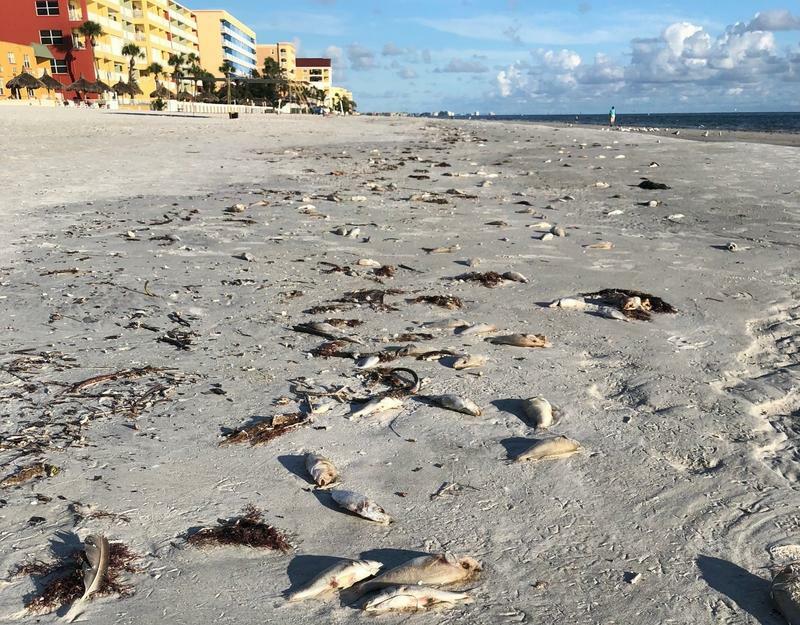 While the fish kills have stopped washing up on Pinellas County beaches, red tide is still an ongoing problem in the area. The Board of Commissioners voted recently on an agreement with the state that would give the county an additional three million dollars for red tide cleanup.